This is where you will find new information about our work. Barbara has been busy through the last year, and will be exhibiting her work at the Horsebridge from Wednesday, 27th February 2019, to Tuesday 12th March 2019. 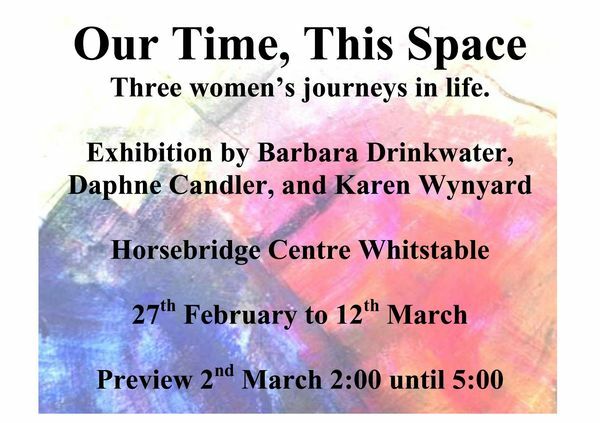 This exhibition is titled "Our Time, This Space", and will be shared with her friends, two other local artists - Daphne Candler, and Karen Wynyard. She will also be exhibiting at the Horsebridge from Wednesday, 13th March, 2019 to Tuesday, 26th March, 2019, along with other members of the Fishslab Collective. The title of this exhibition is "Revenge"